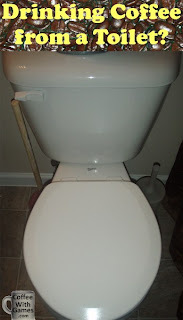 Coffee With Games: I Drank Coffee from a Toilet, and Will Continue! If you saw my post in October titled, "My Birthday Coffee Gift Items - Part I", well this post would be "Part II". Early in October a package arrived on my porch which I assumed was a birthday gift, so I left it unopened until right after midnight on my birthday. When I opened up the package it contained the coffee mug you see in the images above, properly titled "Toilet Mug". My brother and sister-in-law were the ones that gave me the wonderful gift, and I appreciate it very much! 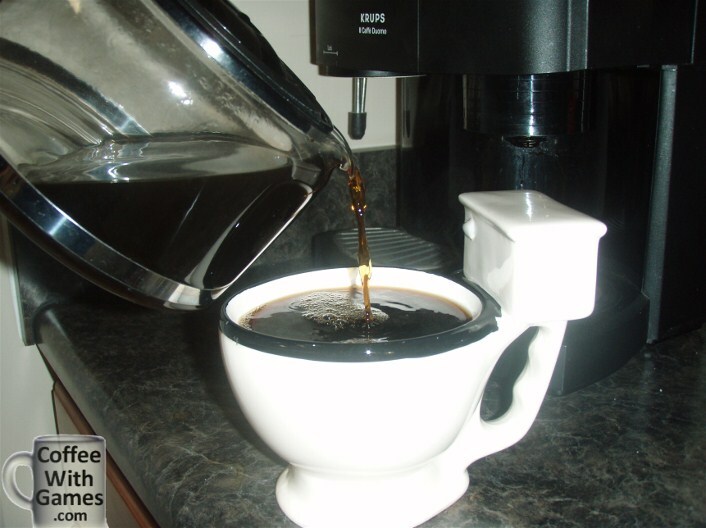 The Toilet Mug holds about 12 ounces of coffee which is nice, and makes for fewer trips to the coffee pot. A description on the Toilet Mug box reads, "Why should dogs be the only ones who get to drink out of the toilet? Enjoy a nice, hot beverage in this unique mug shaped like everyone's favorite throne." The description ends by saying, "Great for those Monday morning coffee breaks at the office! 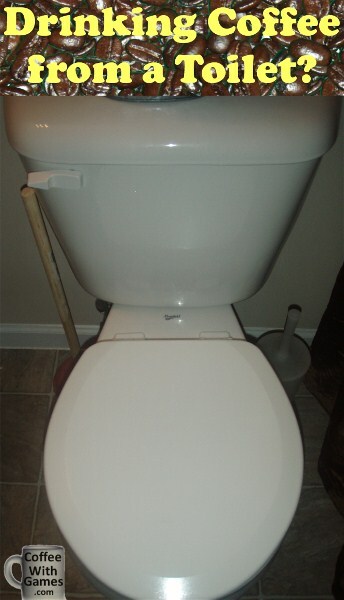 The Toilet Mug takes after a real toilet when it comes to cleaning. Just as you can't throw a toilet in a washer for cleaning, the Toilet Mug is not dishwasher safe and it must be scrubbed/washed by hand. A big thanks again to my brother and sister-in-law for the gift, and I will continue to drink coffee from a toilet thanks to them! Do any of you have an awesomely designed coffee mug that you enjoy using? If so, feel free sharing an image link to it in the comments below, or just a description of what it is. ROFL - that was pretty awesome. And quite the catchy article title. I was compelled to see what the heck you meant, LOL. Mine are pretty standard mugs - nothing that creative. LOL! Much like Chalgyr, I HAD to read further. I took one look at the title and thought, "No....no Coffee....why?....there are people that can help with this sort of thing." Hahaha, nice man. That mug's hilarious, dude! DISQUS roooooolzzzzz even with no comment transferring. "No...no Coffee...why?...there are people that can help with this sort of thing." I'm sure this has been thought by others of me, in other areas! As for your missing coffee mug, that's odd. I can't remember having a coffee mug go missing, but a few(very few) have been broken over the years, but it just seems out collection keeps growing. Also, what blend were you drinking today? Glad you enjoyed, and thanks for sharing your favorite mugs! So, the comments section is working well now. Thank you all for the comments/feedback so far, and Nathan that commented above sent me an email with an image of his favorite coffee mug in it. Take a look at it below! He said of the mug, "My favorite mug is the black and tan one--its an old-school map of the world design that is an oversized ceramic coffee mug with travel top." If you live in a rough neighborhood this may be a good choice. Nice! I wonder if this was the result of a brass knuckle shop getting closed due to regulations? Either way, this is nice to know you have some added security with your cup of coffee. The part I like the best is that it's slim, tall and has a handle that I can easily fit 3-4 fingers in. I hate mugs with small handles. I think being tall it keeps the coffee hot longer. Yea, I think the more slender a mug is the hotter the coffee will stay, because there's less coffee exposed to the air. As for getting mugs to places traveled, I haven't done it every place we have gone in the past, but it's becoming more of the norm now for me. Some people get shirts, I get the coffee mug. The first time I saw the title, I thought you drank coffee while you're on the toilet. When I read it down, I saw the photos it made me laugh. It was a toilet mug. hahaha. Great idea for gifts. DISQUS rooooooolzzzzz even with no comment transferring. "No....no Coffee....why?....there are people that can help with this sort of thing." As for your missing coffee mug, that's odd. I can't remember having a coffee mug go missing, but a few(very few) have been broken over the years, but it just seems our collection keeps growing. Also, what blend were you drinking earlier today? He said of the mug, " My favorite mug is the black and tan one--its an old-school map of the world design that is an oversized ceramic coffee mug with travel top."